It’s here! We’ve finally finished the CD for the Penta Pentamere Dance project! Downloads of this album are available at CDBaby (http://www.cdbaby.com/Artist/MusicaSubterranea) for $6, individual tracks for $1 each. Get the accompanying booklet as a PDF that has both Terp-book style cheat sheet notes and complete instructions on how to do each of the 6 dances on the CD at http://michiganleftturn.org/Penta-Pentamere-Dances.htm. Other online sources for downloads are listed at the bottom of this page. Hard copy CDs will be available in mid-January for $10 each from CDBaby and various SCA merchants. If you’re lucky enough to attend the Pentamere Twelfth Night event on January 3, 2015, you can buy an early-release hard copy CD from the Baron and Baroness of Northwoods for $10! 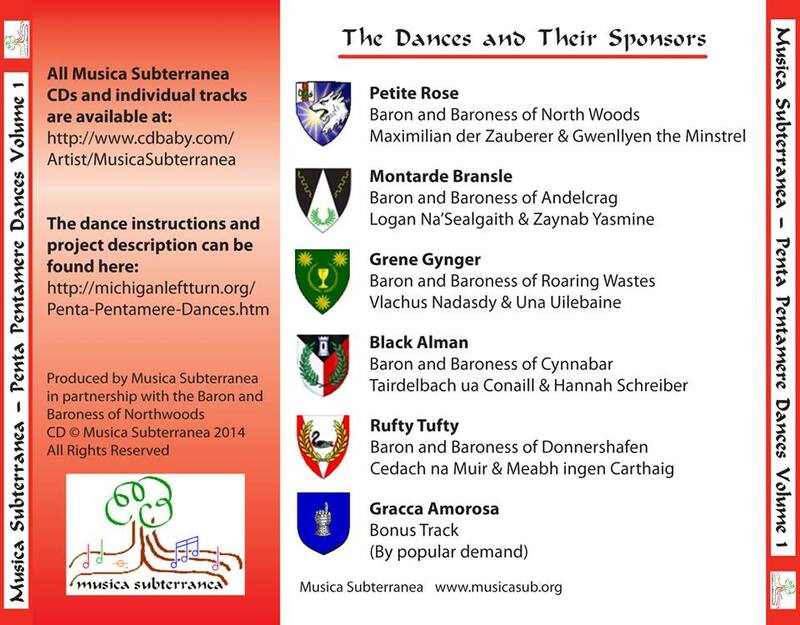 The Baron and Baroness of Northwoods, Maximilian der Zauberer and Gwenllyn the Minstrel, who have been long time friends and supporters of Musica Subterranea, asked us to produce a CD for a project they had in mind to promote dance in their region, Pentamere in the Middle Kingdom (Pentamere = Michigan). They picked 5 dances (ok with the not-so-secret bonus fun track it’s 6 dances) with four other Baronies in Pentamere that as a whole were a great selection spanning eras and styles of SCA dance. The intention is to publish the music and instructions to a small selection of dances so that dance teachers can focus on just these dances and over time the populace will come to know these and dance them at all events. We expect that over time, the people of Pentamere can come to expect these dances will be done at most if not all SCA events in their region, so they can expect to know some dances at most events. Max and Gwen, and all of us in the band really, hope that these materials we’ve produced will fuel the practice and enjoyment of dance for more people at SCA events. We love to dance, and we hope to make it easier for more people to join us out on the floor! Grene Gynger’s melody is an original work by Richard Schweitzer (SCA: Martin Bildner) used with permission by Dave Lankford (SCA: Dafydd Arth) to create an original arrangement for Musica Subterranea. Recording engineering for Black Alman was performed by Ernest Clark (SCA: Emil Allzuwissender) and the cello part was performed by Dan Grabski (SCA: Kjartan). Gracca Amorosa included a citern part performed by Sharon Spanogle (SCA: Teleri). Graphics for this CD were created by Mary Railing (SCA: Urraca Yriarte) and Bob Scheltema (SCA: Maximilian der Zauberer). Petite Rose, Grene Gynger, and Black Alman were mastered in post-production by Phil Reed (SCA: Philip the Pilgrim). 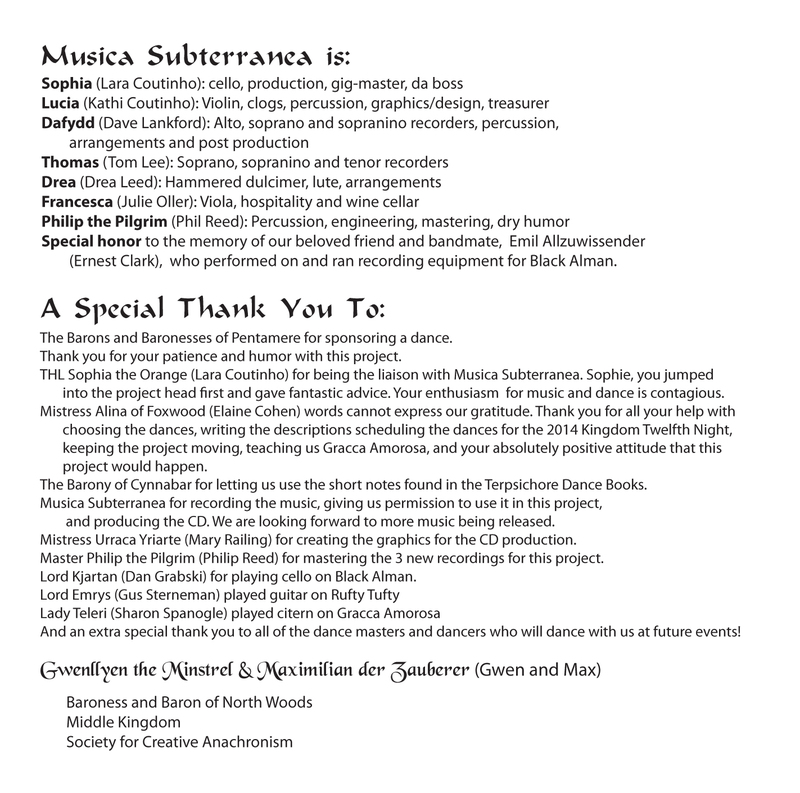 All other work on this CD was performed by the members of Musica Subterranea: Dave Lankford, Lara Coutinho, Kathrin Coutinho, Jullie Oller, Drea Leed, Tom Lee, and Phil Reed. REGARDING COPYRIGHT: Musica Subterranea owns the copyright and reserves all rights to the CD as a whole and the recordings of all music published under the name Musica Subterranea. The arrangements of all the tunes are copyrighted and owned by the authors as noted on each tune. Our primary arranger is David Lankford, and we also have used arrangements from other members including Drea Leed and Gus Sterneman. Grene Gynger is an arrangement created by Dave Lankford based on an original melody used with permission written by Richard Schweitzer (SCA: Martin Bildner). If you make copies of our music to give away or sell, even if it’s to other SCA dancers, it is illegal and breaking our copyright. We have gone to great lengths to make our music available easily and inexpensively, so we hope that piracy is not necessary to use our music. If you are interested in using our music for something that will generate money, please contact us so we can negotiate an appropriate agreement. We have licensed our music to be used in compilations for teaching dance and special SCA dance events with no fees in the past, but we require communication and documentation for such an agreement. Please contact the Musica Subterranea Lead Organizer, Lara Coutinho (SCA: Sophia the Orange) at orangesophie AT gmail DOT com to start that communication. Weclome to the world of Musica Subterranea! Dave / Dafydd on Weclome to the world of Musica Subterranea! Kathi / Lucia on Weclome to the world of Musica Subterranea!